Products based on the upcoming IEEE 802.11ac wireless-LAN (WLAN) standard are indeed going to dominate the enterprise wireless local-area network landscape. But as is often the case with new technologies, the hype surrounding the initial availability of .11ac products is running, to our thinking, anyway, a bit ahead of reality. 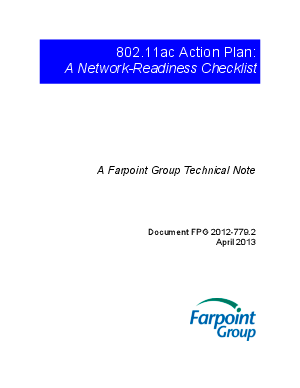 And that’s OK, as the schedule ultimately involved here enables enterprise network planners, managers, and operations staff sufficient time to devise a framework for evaluating the features and benefits of 802.11ac, and especially for establishing a strategy and plan to roll out .11ac infrastructure within their organizations – the subject of this Farpoint Group Technical Note.